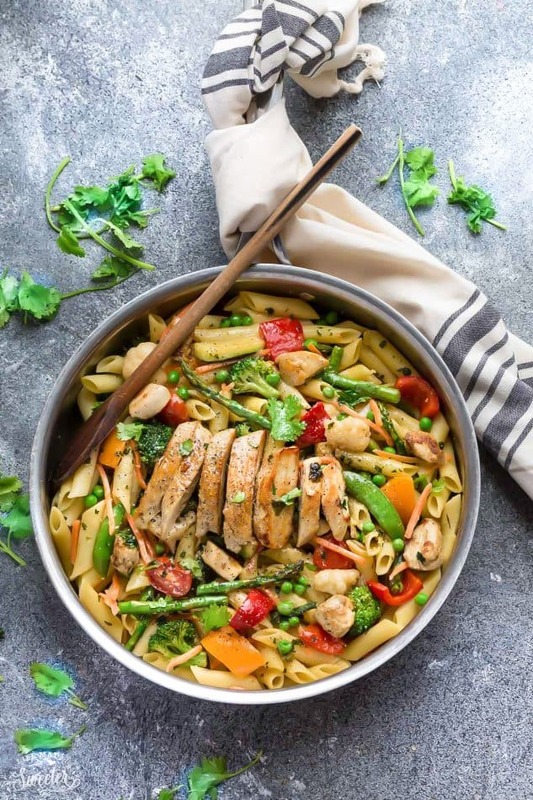 Lemon Chicken Asparagus Pasta – this recipe makes the perfect easy 30 minute meal for busy weeknights. 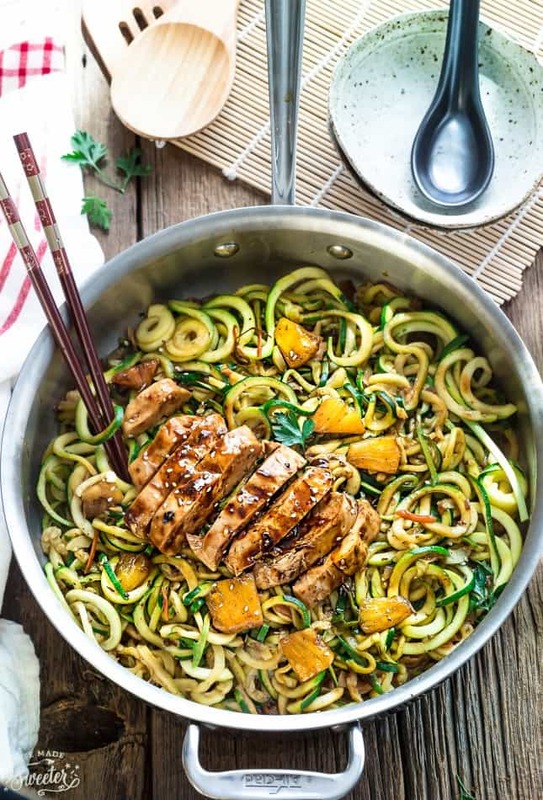 Best of all, so simple to customize and full of bright spring flavors! With spring finally in full swing around here, I can’t get enough of all the fresh produce we’re seeing everywhere. 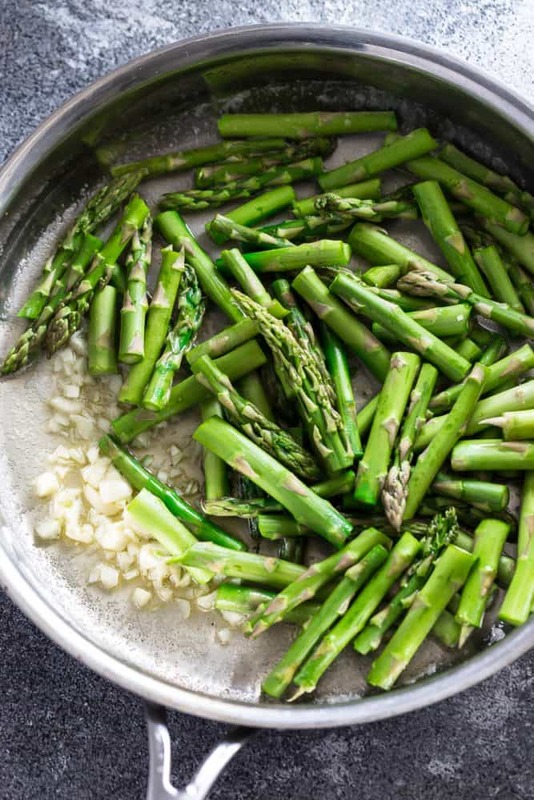 Asparagus is by far my favorite spring vegetable and I love pairing it with lemon and garlic. Roasted asparagus is totally my idea of heaven but I don’t think my husband and kiddos would be on board with just veggies for dinner ? So, the next best thing? 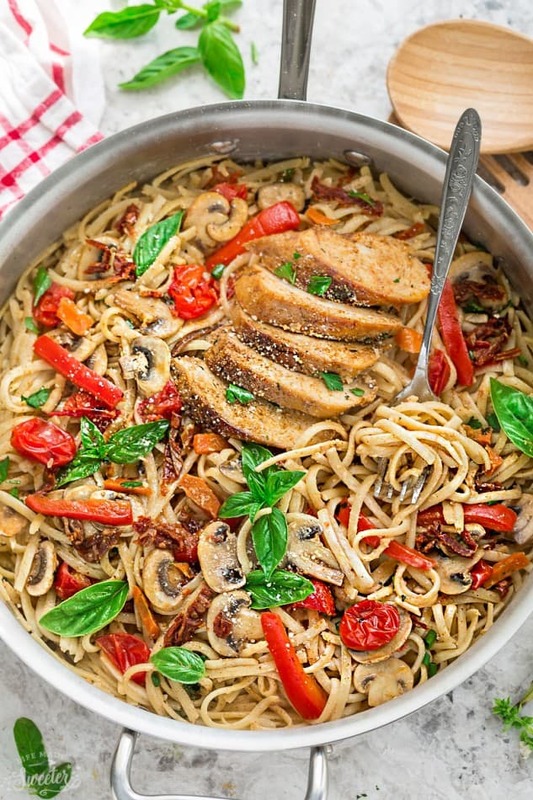 Throwing them together with some tender chicken and creamy pasta, for one simple and amazing meal! And it comes together in just 30 minutes so it’s just perfect for those busy weeknights! 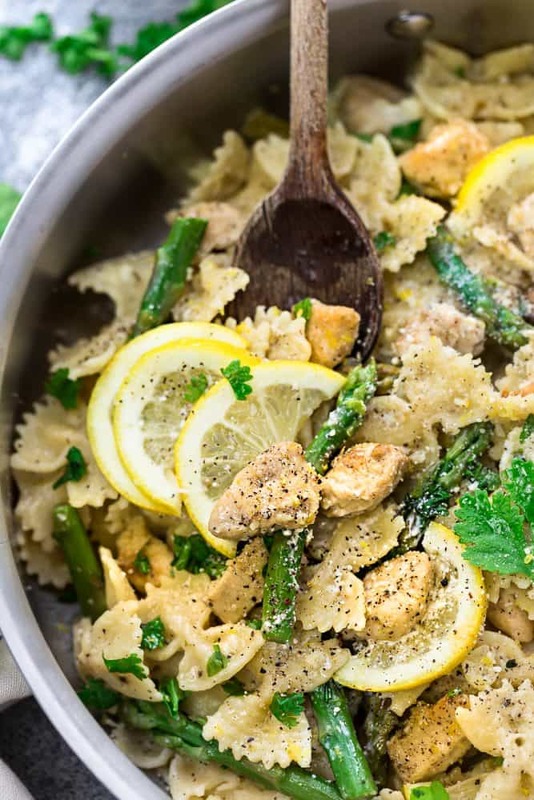 This Lemon Chicken Asparagus Pasta is a quick and easy dish bursting with bright and fresh flavors. And I love that it’s pretty simple to customize by tossing in any other veggies. For this recipe, I used farfalle (bow tie pasta), but penne or any other medium-length pasta you like would be delicious. 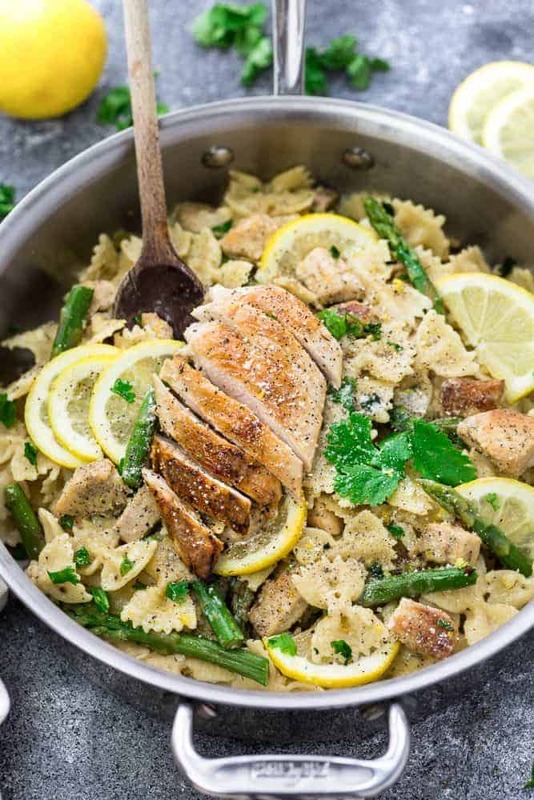 The chicken, asparagus and creamy lemon garlic sauce cook up in the same pan, soaking in all those refreshing flavors. Serve with some cheesy parmesan, fresh lemon slices and chopped parsley for an incredibly tasty family-friendly dinner! leftovers are delicious when packed in school lunchboxes or work lunch bowls. 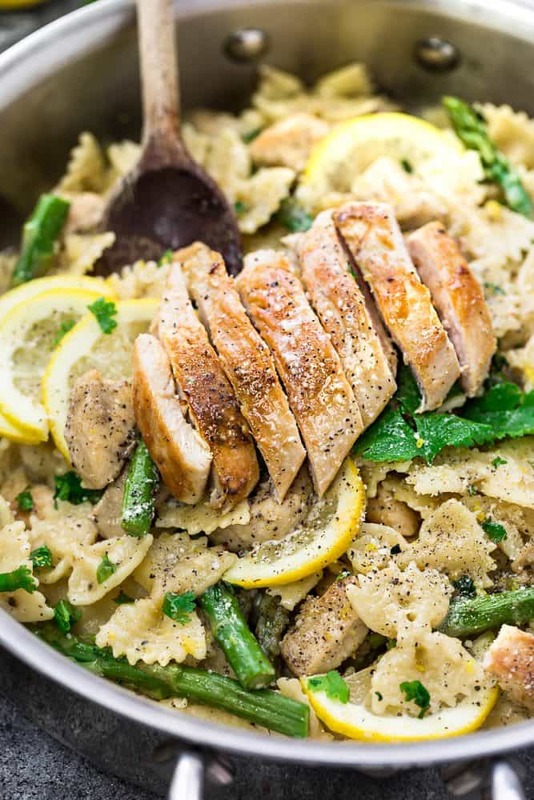 Lemon Garlic Chicken Asparagus Pasta - with sautéed chicken and tender asparagus, tossed in a delicious creamy lemon garlic sauce. In a large pot bring water to a boil and add the pasta. Cook according to package directions. Drain and set aside. While the pasta cooks, heat olive oil in a large skillet over medium-high heat. Add the chicken and season with salt, black pepper and oregano. Cook for 5 minutes, stirring occasionally until browned and cooked through. Add 1 teaspoon minced garlic and cook for another minute, until fragrant. Transfer to plate and set aside. Add butter to the same skillet and melt over medium high heat. Add remaining minced garlic and asparagus and sauté for 1 minute, until just starting to turn bright green. Whisk in the cream, lemon juice, lemon zest, garlic powder, oregano, parmesan and mozzarella cheese. Allow the sauce to thicken and cheese to melt. Add the drained pasta and chicken back into the skillet. Season with salt and black pepper to taste (I used about 1½ teaspoons salt + ½ teaspoon black pepper). Toss to coat well until everything is heated through. Serve hot and sprinkle with more parmesan cheese, chopped parsley, and lemon slices, if desired.